Air Robot Co. Ltd. is a technology-Intensive company that specializes in the development and manufacturing of robots. Air Robot researches. develops. and manufactures robots and Micro Aerial Vehkles (MAVs) and trades in these products via an e—commerce business. Air Robot is working on the development and commercialization of mkro-mina rotorcrafts using a new principle of flying. It Is also pursuing the development and commercialization of commercial robots by applying artificial- Intelligence robot technology. The robot business and the Micro Aerial Vehicle (MAV) busrness are achieving dynamic growth for Air Robot. The company has maximized the synergy effect and created a complementary business portloho. Ills also operating Toy Mart (www.toymart.co.kr). 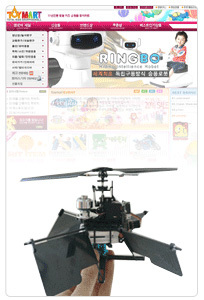 which Is the first online shopping mall In Korea specializing In toys. In order to obtain its own distribution channel and to maximize profitability. “Toy Mart?vww.toymarti.kr), which was established as the first online shopping mall specializing in toys in Korea in 1997, stocks a total of 7,000 items such as toys, infant items, and clothes. The shopping mall has prov ided a reliable service to customers, and has good recognition among the toy shopping malls of Korea. In particular, the stable profit structure based on long-standing customers as a result of Its long history and tradit ion, has helped Air Robot to acquire tremendous know-how about the characteristics and distribution of the toy market. As a manufacturer, Air Robot launched the Riding Intelligent Robot (RINGBO), which was the world’s first comm ercial riding robot to be sold as a toy. This product has been exported and sold both domestically and overs eas and has aided the development of further proprietary products. It has also facilitated the development of domestic and overseas toy markets, which can become stagnant due to a lak of creative ideas. Air Robot developed a new principle of rotor MAVs that maintain a hovering action by using a single rotor and has obtained a patent for it. The patent of this technology has been registered in Korea. the U.S., and Japan. H & D Is being performed on the technology for the purposes of war and other diverse industries. Air Robot plans to perform the mass production and sales of these “micro flying toys?based on their technical capabilities; they can be used to successfully work on governmental development projects related to MAVs br the first time In the world. The company has performed a series of H & D tasks. The main competitive edge that Air Robot provides is to give consumers concrete and meaningful products with creative ldeas that can be implemented in order to resolve problems rather than simply new, exceptional ideas. Air Robot Is making every effort to evolve into”a creative engineering cOmpany?that implements this very process.